CME iLink®: The Order Server connects via FIX protocol to the CME Globex order routing interface. 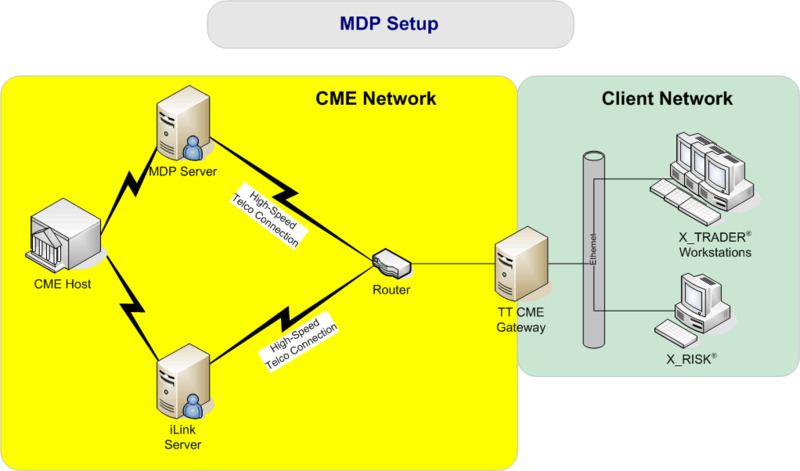 CME Market Data Platform (MDP): The Price Server subscribes to and receives prices from the MDP which is a dual-feed multicast market data dissemination system. TT recommends all Gateway software be installed on server class machines. For server class machine specifications, refer to the TT Trading Systems – Hardware and Software Requirements document located on the TT Customer Portal. CME Gateways communicate with the exchange via a number of different options that can be either customer or exchange managed. Different hardware and circuits will be utilized and provided, depending on which solution is chosen.